If you have a Mexican main course which you want to accompany with a garnish and you don’t know which to prepare. The peasant rice can be a very good option. The rice has acquired a very important role in the Mexican cuisine , since it was introduced by the Spaniards in the Colonial period; which was brought from the Philippines. Since then we can assure that the rice constitutes the most common “dry soup" in the majority of the Mexican homes. 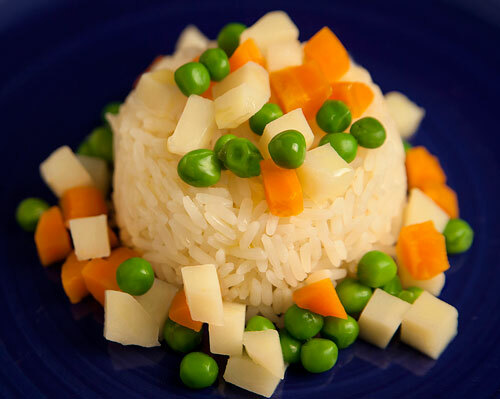 In this recipe white rice with carrots, peas and potato are combined in a majestic way. As you can imagine it is a dish full of color, full of contrasts and full of flavor . In fact it is a good way of making people to eat vegetables that usually don’t eat them. The peasant rice goes very well with almost any type of Mexican main course like: grilled steak , cecina , chicken in adobo , chorizo and potato flutes , etc. This rice is very easy to prepare, you have nothing to fear. You only have to chop vegetables, fry some ingredients and cook the rice – that’s all. The “golden rule" to cook rice is that the liquid has to double the rice. We recommend using a saucepan with thick bottom and not too tall so the rice doesn’t burn and gets the best consistency. The total preparation time is of 25 minutes , although for 20 minutes you won’t work in the recipe. Peel 1 potato and 2 carrots. Dice the potato and the 2 carrots that were peeled; then set aside. Rinse in a strainer 2 cups of white rice, then reserve. Heat in a saucepan over medium heat 3 tablespoons of olive oil. Fry the saucepan ingredients for approximately 1 minute, until the onion looks a bit transparent; stir regularly. Reduce to low heat and put in the saucepan the 2 cups of white rice that was rinsed and fry it for about 45 seconds, until it acquires a little lighter color; stir constantly. The dices of the Potato and the Carrots that were cut. When the cooking is done turn off the heat and leave the peasant rice resting for about 4 minutes, until the rice grains absorb the moisture and are loose. Tip: The peasant rice tastes delicious with lime , try it. Recommendation: Serve this rice with some shrimp brochettes to the achiote. We are sure that you will impress your relatives and friends with this main course. Variations: Other types of Mexican rice that you will like: Puebla style rice , red rice , Mexican rice , etc. Did you like the Peasant Rice? For this recipe you can use the “Lundberg White Rice", because when this rice is cooked it grows a lot and it remains separated from the other rices; just what it is looked for in this recipe. The “OXO Y-Peeler has a very good grip, it offers very good control at the moment of peeling and its blade is very sharp. It really is a fantastic peeler.